We offer 21 different flavors. $8 per 8-ounce jar. It began with a memory of homemade jam—and the longing to recreate the simplicity of it. You remember—there was nothing like it. Making our jam began as a way to offer something different for special occasions. From the beginning, this was not just any jam. It was a new take on remembered recipes—back to basics: fruit, sugar, pectin, a little lemon juice and that elusive ingredient, caring. People we knew began requesting their favorite flavors and savoring the jam with friends, colleagues, and loved ones all over the world. They, in turn, kept urging us to offer our jam to a much wider audience. So, with fans already in India, Sweden, and Brazil, not to mention all across the United States, we took the plunge and created S&V Jams—made in small batches and with exacting care. Fans of S&V Jams have enjoyed the jam as a pie, tart, or crepe filling; stirred into yogurt or batter for waffles and pancakes; dished onto ice cream; as an accompaniment to meats or cheese; and even as a spoonful of sweetness right out of the jar. And the meaning of S&V? Straightforward and versatile. Straightforward, because it’s made the way jam used to be made—without any additives, preservatives or excessive sugar. Versatile, because it’s not just for breakfast. Contact us to place your orders directly. 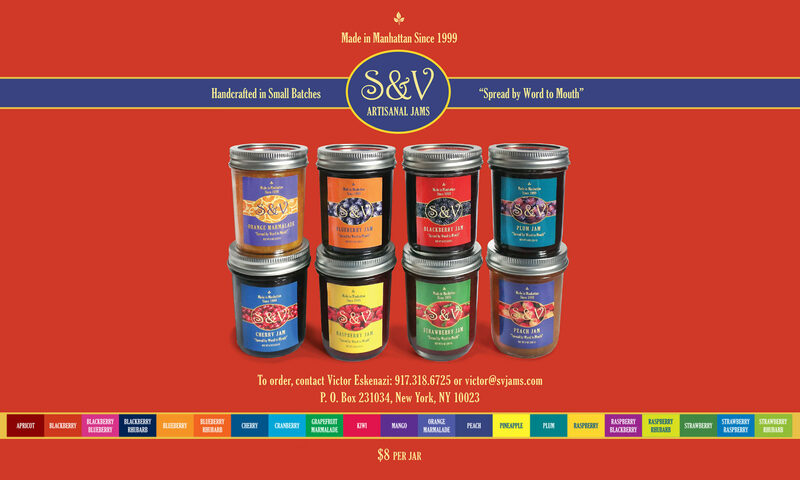 S&V Jams are versatile gifts for any time of the year and a great way to keep your pantry stocked. At the very least, they’re a wonderful reward to yourself. S&V Jams—the way jams used to taste. ”Spread by Word to Mouth” ©. Enjoy. Join us on Facebook to keep current with our new offerings, pop up tastings, and the seasonal markets we attend.